What this write-up is about? Do you or your loved one have excessive fear or disgust with regard to contamination? Do you or your loved one have an uncontrollable urge to hoard useless items? Do you or your loved one have preoccupation with symmetry and order? Do you or your loved one have excessive fear, worry, and preoccupation with blasphemous thoughts and praying ‘perfectly’? Do you or your loved one suffer from unwanted, worrisome, and intrusive sexual or blasphemous thoughts? Do you or your loved suffer from excessive and illogical hand washing? Do you or your loved one take half an hour for ablution (wudhu)? Do you or your loved one check over and over whether the doors and windows are closed? If the answer to any of the above is YES, then this write-up is for you. If NOT, you may still read it. What this write-up is not about? This write-up is not about the secret spell to summon angels from the sky that will cure you from OCD instantaneously. This write-up is not about how a certain medication can cure you from OCD in a jiffy. This write-up is certainly not about the spirit of your late great grandfather’s enemy that cast a spell on you and made you into an OCD sufferer. And, this write-up has nothing to do with Sigmund Freud, Karl Marx or Lucifer. This write is not about ‘solution to OCD’ it is mainly about ‘understanding OCD’; however it does touch the topic of solution at several parts. ‘So what is this OCD that you keep on writing about?’ a question I’m often posed. A wide inter-connected stream of thoughts run through my mind: intrusive thoughts, demonic possessions, satanic injections, cognitive restructuring, institutionalization of doubt, vicious circle of obsessions, the self-invented rituals etc. In few seconds I tailor my answer and put it in simple words. In the end it gets too simple and the questioner is rolling his eyes thinking ‘crazy freaks, why they have to check the doors and windows 16 times’. We are living in times where psychological disorders might handicap our lives to extreme lengths. These disorders might limit you to the confines of your ‘holy ground’ that might be your home or your room, or it might even reach a stage where you start questioning your own sanity. But, other than those who suffer, most other’s ‘just don’t get it’. Even when people don’t say it out, their look gives you a suggestion what their thinking ‘this dude is crazy’. When they see you taking ages to wash your hands, they would rather assume something’s wrong in your head, rather than think you are suffering from a disease or a disorder. So, when I tell people about OCD, they assume that this is just a crazy way of thinking, paranoia, and an over estimated fear and these psychologists have given it a name. Judging from their looks I can realize that they think ‘it’s not really that serious, that you keep on writing about it every day’. So, I just have to drop in the neurological explanation and bring in the thalamus, serotonin, brain chemicals and neurons. Or, at times I have to bring in the extra dimensional explanations. It’s only then when people think ‘Oh, so, it is serious’. In some societies and cultures, if you go to a psychologist or a psychiatrist you will be stigmatized. Hence, most of the OCD patients, just battle with their disease alone without sharing their thoughts with their family or friends because in many societies people would just shrug it off saying ‘don’t be crazy’. Or if they tell their family or friends that they have a psychological disorder, they risk a terrible blow to self-esteem, as unaware of the distinction between insanity and disorder; people might start questioning their sanity. So, people who suffer from psychological disorders in general and OCD sufferers in particular have to fight this battle alone for their whole life or for many years until they finally decide to announce it. The purpose of this write-up is to give the family and friends of OCD sufferers a journey into the brain of their loved ones. In simple words, I want to show them ‘it’s serious’ and I want to show the OCD sufferers ‘it’s not so serious’. In the end I’d like to give some guidelines to those who have a loved one suffering from OCD. Most, if not all, OCD patients have vivid memory of a particular event which totally modified their perception, cognition, behaviour and life. This event might have occurred during or following a major depression. One OCD sufferer clearly recalls the falling of asbestos on his body during some household work. This triggered a chain reaction of thoughts. He became obsessed with the fear that he might be contaminated that might lead to a disease that might prove fatal for him or his loved ones. To add to the misery, these thoughts resulted in anxiety and depression. To get out of his thoughts he needed to get out of depression. But, to get out of depression, he also needed to make sure that he’s ‘clean’. To make sure he’s clean he needed to wash himself ‘thoroughly’. The process of cleaning became a ‘ritual’. But, if he cleaned himself ‘the right way’, the compulsions would grow and the cleaning would become more and more ‘thorough’ and time-consuming. But if he does not clean the obsessions would grow. In this way OCD formed a force-field of its own that wouldn’t let him out. The only time he felt ‘just right’ was immediately after ‘performing’ the compulsions. Another OCD sufferer recalls how her OCD began when she had a feeling that she might have touched her private parts while asleep, making her hands contaminated, resulting in the contamination of the whole bed, to a point where the house hold became ‘contaminated’. According to a research 56.9 percent of people with OCD were diagnosed with a major depressive episode first. And some OCD experts estimate that 90 percent of people with OCD have depression secondary to their OCD (Yaryua-Tobias and Neziroglu, 1997, quoted in Hyman, B and Pedrick, C., 2010: 32). It is very important to understand this relation between Obsessions, Compulsions, Depression and OCD. Patients become vulnerable to OCD in times of major depression. In times of major depression, a particular event or series of event might trigger OCD. On the other hand, OCD cause depression on its own as well. Perhaps depression is a natural outgrowth of having a devastating disease such as OCD, which impairs your life to a great extent accompanied with constant guilt, shame and fear. In times of this depression, they need someone who empathizes with them and realizes what’s going inside them. At times, family members or friends might resort to anger to overcome this problem. Anger only multiplies the depression, anxiety and fear of the sufferers resulting in even severe obsessions. Love on the other hand, proves to be a very strong antidote for the problem. Essential features of OCD (Obsessive Compulsive Disorder) are the repeated occurrence of obsessions and/or compulsions of sufficient severity that they are time-consuming (> 1 hour per day) or cause marked distress or impairment (American Psychiatric Association, 2000). In simple language, few people get over taken by certain uncontrollable thoughts (obsessions), which are at times accompanied by self-invented (compulsions) rituals. When these obsessions and/or compulsions taken more than 1 hour per day, then a person is said to be suffering from OCD (Obsessive Compulsive Disorder). The most common OCD obsessions and compulsions are given below (Ramussen and Eisen (1998). Approximately half to three-quarters of individuals with OCD have multiple obsessions (Ramussen and Eisen, 1998). That is why they don’t add up to 100 percent. OCD sufferers realize that there’s no need to wash the hands for half an hour, but they can’t help it. They know that it sounds crazy to check the doors and windows sixteen times. They know that its irrational to spend an hour in the toilet. They try to hide their embarrassing rituals. - In scrupulosity, religious practices go far beyond the requirements of religious law and custom, and people may act more ‘catholic than the pope’. Muslims start acting more religiously than Prophet Muhammad, himself. - In scrupulosity, beliefs or practices have an overly narrow, trivial focus. In prayer, excessive attention is devoted to ‘saying it right’ or ‘perfectly’. The person with scrupulosity spends excessive time and energy on minute, trivial aspects of religious observance, often ignoring more important aspects of spiritual life. 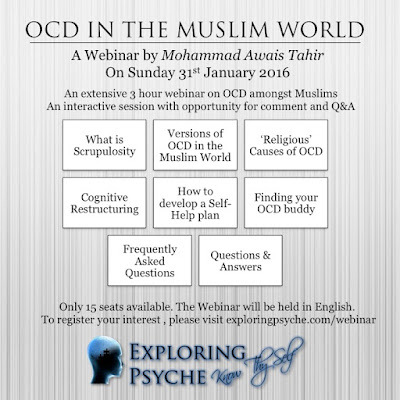 As a result, Muslims with OCD start taking half an hour or even more for ritual purification (ablution). - Scrupulosity interferes with practicing the religion, such as when a person with blasphemous thoughts avoids going to church/mosque altogether. - The excessive preoccupation with doing religious rituals until they are ‘just right’, praying repetitively, and confessing unnecessarily etc. According to Hyman and Pedrick (2010) strong religious beliefs do not increase the likelihood of religious OCD (scrupulosity) because OCD is seen as a neurobehavioral disorder; a biological predisposition is a necessary factor in developing OCD. For those who do not have strong religious beliefs, OCD may take other forms. In many cases, OCD does not start as a religious OCD, but later on takes this form. If left untreated on its own, OCD feeds on its own and grows stronger. If the sufferers do not ‘obey’ the compulsions the anxiety and fear multiplies and if they obey the compulsions they become more severe in intensity. OCD sufferers encounter severe anxiety or fear which is chronic or triggered by certain events. These chronic/triggered anxiety or fears are annoying undercurrent of electricity in the brain, humming day and night. When OCD sufferers are prevented from following their rituals they experience vague, unsettling feelings when nothing ‘feels rights’. A time comes when sufferers are so much habituated into compulsions that a slight infraction or change is magnified a thousand times, and causes physical discomfort best described as that feeling you get from sharp nails scratching a chalkboard, creating waves of nausea. OCD is a breeding ground for vicious cycles – the disease, left untreated constantly feeds on itself. OCD, unchecked and untreated, can splinter into multitude of manifestations. There is no logical, or predictable, path of progression of the illness. What began as an OCD related to cleanliness and hygiene might also start including hoarding and checking. Seemingly small obsessions can grow exponentially. The urge to do every activity twice might extrapolate to twenty times. How an OCD sufferer sees himself? The madness of OCD is that while the irrational mind is operating, it victim is able to observe and recognize this behaviour. It is neurologically based anxiety disorder with symptoms that often look ‘crazy’ to outside observers, but sufferers aren’t crazy at all. Victims of OCD know that their illogical behaviour has no logical basis. Knowing this just increases their suffering all the more, because without treatment they are unable to stop it. They know to that they are acting crazy but at the same time they are wise enough to know that they are not crazy. Why they can’t break free? Why OCD sufferers find it hard to break-free from these thoughts and compulsions is that they are trapped in a vicious circle. Compulsions, by the pure nature of OCD, reinforce the cycle. The more you indulge in these sorts of compulsions, to get relief from the obsessions of OCD, the greater the intensity of OCD demands. And if you ignore these compulsions you feel extreme anxiety. A deeper answer of why it’s hard to defeat OCD lies in what are the root causes of OCD. How does it all begin? The exact causes of OCD are still ambiguous. Researchers are trying to piece together the puzzle. i. Does it run in families? Inherited tendencies include subtle variations in brain structure, neurochemistry and circuitry. OCD is speculated to be, at least in part, a genetically inherited disorder. There is no solid proof to suggest, though, that OCD is genetically transmitted or by what mechanism. However, many researchers have held the opinion that is genetically inherited. It might as well be inherited because the child follows the parents, and learns the compulsions as the normal way to do since birth from one of the parents. Nonetheless, there is nothing conclusive to prove whether or not OCD is transmitted genetically (Davis, 2008). The most widely held biological theory of OCD is that it is related to abnormal functioning of one of the brain’s vital chemical messengers: serotonin. Serotonin is in the class of chemicals known as neurotransmitters, compounds that nerve cells use to communicate with one another. Serotonin plays a role in many biological processes including sleep, appetite, body temperature, pain, mood, aggression, and impulse control. Many recent studies also indicate that the brain chemical glutamate plays a role in OCD (Lafluer et al. 2005). Brain imaging studies have demonstrated abnormalities in several parts of the brain in people with OCD. These include the thalamus, caudate nucleus, orbital cortex, and cingulate gyrus. The thalamus processes sensory messages coming to the brain from the rest of the body and the caudate nucleus controls filtering of thoughts, the orbital cortex is the part of the brain where thoughts and emotions combine and the cingulate gyrus helps in shifting attention from one thought or behaviour to another. If you find it difficult to empathize with OCD patients then realize that it might be that the thalamus of OCD patients sends messages from other parts of the body, making them hyperaware of everything going on around you. And their caudate nucleus opens the gate and lets in unwanted intrusive thoughts. Their Orbital Cortex gives them the feeling that something is wrong. And the cingulate gyrus tells them to perform your compulsions to relieve anxiety the rest of the brain has heaped on you. Some autoimmune diseases like rheumatic fever, pediatric streptoccal infections, lupus, and Sydenham’s chorea, also may be related to some instances of OCD. In addition, some studies have shown an association between OCD and head trauma, brain tumors, epilepsy, hypothalamic lesions. However, in most cases OCD does not have such dramatic causes (Jenike 1998). Environmental factors include psychological and physical trauma, childhood neglect, abuse, family stress, illness, death, and divorce, plus major life transitions, such as adolescence etc. This extra-dimensional explanation resolves a contradiction in the details of OCD as understood by main stream psychologists. On one hand they say that "The individual senses that the content of obsessions is alien, not within his/her own control and not the kind of thought that he/she would ever expect to have." (American Psychiatric Association, 2000:457) On the other side they also say that "the individual is able to recognize these obsessions as the product of his/her own mind" (American Psychiatric Association, 2000:457). The question arises "how can a person be able to create thoughts that he/she does not even expect to be his/her thought?" From an extra dimensional point of you, it is the Shaitaan (Satan, devil) that confuses you. The strategy of Satan is that it looks for opportunities when you have anger, fear or anxiety and then it capitalizes on them by exaggeration. These recurring, intrusive thoughts are referred to as Was-was-ah in the Islamic literature. The very etymology of the word Was-was-ah shows the recurring, intrusive nature of these thoughts. The characteristics of Obsessions laid down by the psychologists are precisely what the Islamic Sources tell us about intrusive thoughts from Shaitaan. And, as the enemy is invisible we are unable to recognize that these are not our thoughts. Furthermore, the enemy merely needs to plant the doubt, and then humans nurture it on their own, remember that OCD feeds on itself. In 1973 a researcher wrote about OCD with confidence that it is ‘unquestionably one of the rarest forms of mental disorders’ (Davis, 2008:209). And, now after just a few decades we are living in times when OCD is considered the fourth most common mental disorder (National Institute for Health and Clinical Excellence, 2006). World Health Organization’s 2001 mental health report mentions Obsessive Compulsive Disorder as one of the top 10 causes of disability in the world (Davis, 2008:210). Davis (2008) questions this sudden rise in OCD, and attributes it to the way perception has been modified by mass-media campaigns etc. He argues that we are living in an age of ‘obsessional panic’. Hence, OCD has a socio-cultural history. We are fed with obsession since we grow up. I stumbled upon a television ad today regarding hand sanitizers which started with ‘it takes time to learn few things like washing your hands’. If we are made to believe that washing our hands is a skill that requires training and ‘equipment’ no wonder we end up with the ‘ The boy who couldn’t stop washing’, that is the title of the book published in 1991 and considered as an eye opener on OCD. Imagine yourself as an individual with this rare disease of OCD in the 1970s. You would have considered yourself to be alone and odd and you would have questioned your own sanity. And now we are living in times, when OCD is certainly something which attracts a lot of interest and research. It is certainly recognized as a mental disorder, and it does help the sufferer in realizing that ‘he is not crazy’. However, all this ‘authentic’ research should not stop us from questioning as to why we have reached a stage where a non- contagious disease like OCD is multiplying several folds everywhere. The researchers are still trying to analyse how brain is affected by OCD, or how OCD is affected by brain, but there is nothing concrete still. And even if we do discover the part of the brain where OCD resides its significance would be rather limited without the understanding of the biography of the disease. It is worth pointing out that the definition of OCD and OCPD (obsessive compulsive personality disorder) has kept on changing over the years. The definitions have been amended from DSM I to DSM IV. And still, ‘no matter how tightly rigorously we define OCD in contemporary psychiatry, there is still conceptual over-lap with various ‘diagnostic near-neighbours’ (Davis, 2008:211). Hence, I have abstained from going into the depth of the thin-line differences between OCD and OCPD and other neighbouring disorders, because they might share the same biography and the same treatment. Hence, we cannot understand diseases like OCD without a thoroughgoing knowledge of social, cultural, historical, anthropological, and political view of that ‘disease entity’ ( a term coined by Davis, 2008). The history of disease itself contains a therapeutic narrative. What is in essence a biocultural knowing of diseases can empower patients as well as physicians to rethink the way that disease is enforced and distributed through cultures and represented in popular and professional imaginations. In bioculutral case, the disease isn’t controlled through cure and eradication, although those goals are always worthy ones, but through a systematic rethinking of the way disease is structured and positioned in our society (Davis, 2008). If knowledge is power, then the knowledge of disease amounts to a kind of power over that disease. Particularly in the cases of mental disorders, the way we think about the disease entity has a lot to do with how the sufferer regards his or her condition. Hence, the sufferer of OCD needs to be empowered as to how our view of obsession has been altered over the years, which is essential for cognitive restructuring i.e. perhaps the most important element of cognitive behavioural therapy. Tracing the Socio-Cultural history of scrupulosity is even more essential. Religion has existed as long as humanity has. The ‘quantitative’ view of religion, one of the causes of scrupulosity has to be traced and eliminated through logical and scriptural reasoning. The case of the Children of Israel in Bible where they were forced to follow ‘impossible commandments regarding purity’ has a lesson for all those who suffer from scrupulosity. Children of Israel demanded ‘detailed and comprehensive’ rulings for everything, and were obsessed with ‘minute details’ and hence they were forced into these impossible rulings as an admonition and as a warning for those to come. Nevertheless, the same did happen with Christianity and with the Muslims. Prophet Muhammad had prophesized that Muslims will make same mistake like the children of Israel. The prophecy came true and in the name of ‘explanation and exegeses’, the religious practices and rituals were made to look like mathematical equations. Books with ‘detailed rulings’ of prayers were published and preached with pride, which took away the very spirit of worship away and made religion look like a mystery and, hence, resulted in the epidemic of preoccupation and obsession with fear of minute errors in religious rituals. On the other hands the flood of movies, books that preach atheism in blunt or covert fashion triggered the ‘doubts’ that resulted in the feelings and thoughts that OCD sufferers cannot even pronounce. Far away, from the time when the final book of God was brought to humanity alongside the role-model who preached its implementation, we are living in times when religion is presented either as a myth or a mystery, and both of them trigger OCD. 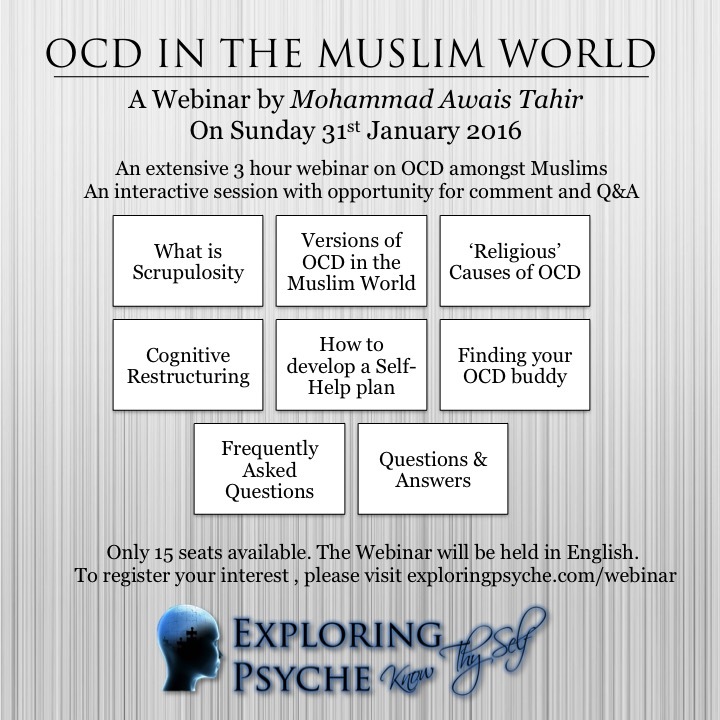 Hence, OCD certainly has its socio-cultural or ‘religious’ roots that need to be traced and eliminated. When OCD became common it was echoed as a ‘hidden epidemic’ that suddenly came to surface. However, with the right analysis of socio-cultural or religious factors that resulted in the mental disorder would make it clear that OCD was more of a ‘triggered epidemic’ rather than a ‘hidden epidemic’. OCD isn’t just a personal matter. It also affects family and personal relationships, often in profound ways. Living with someone who has OCD is frequently painful, baffling and frustrating. The disorder can challenge the patience and compassion of even the most benevolent family members. It takes unconditional love to accept someone with OCD. Informed and compassionate family involvement is vital to the recovery process. In order to be successful in combating OCD, your loved one will need your support and cooperation. If a mother cleans the clothes of her son several times a week to give him the feeling of purity is actually unconsciously helping increase the OCD. On other hands, family members need to help the OCD sufferer with Exposure Response Prevention (ERP) in which the Obsessions are triggered , but the response (compulsions) are prevented, de-habituating the sufferer from following the compulsions and showing them that nothing terrible happens when they prevent the compulsion. However, in the beginning ERP is going to be tough. Not following the ritual (compulsion) will trigger extreme anxiety, however, if followed for a long-enough time (let’s say a month) ERP will start showing its effect on how the obsessions and compulsions start diminishing away. Never tell an OCD person that he is responsible for the disorder himself, and do not consider yourself as the reason too. 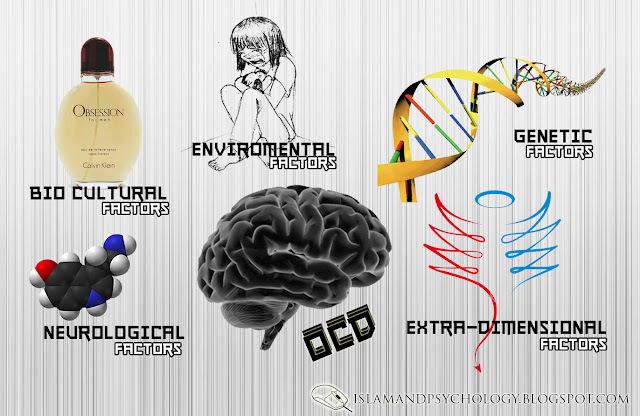 Numerous environmental, neurological, psychological and extra-dimensional factors add up to create this disorder. Realize that people with OCD cannot control the powerful urges they experience. A chemical imbalance and overheated brain circuitry are ruling their thoughts and behaviour. They didn’t choose OCD themselves. Never scold, criticize or show your anger to people with OCD. If you wish to criticize then do that in a frank and humorous manner. Talk about your feelings, but don’t blame your disappointment on the person with OCD. Do your best to empathize with the patient and maintain a non-judgemental attitude. During the course of recovery you should expect sudden ‘backslides’ and be prepared for them. Use verbal praise to reward progress, even when there’s a small progress. Maintain a calm, stable and consistent environment at home. Always show your love for the sufferer, it’s important. Realize that OCD symptoms don’t make such sense. You can make the OCD patient realize that too but try to keep a calm and cool tone when doing so. It would be best to include some element of humour in that. Never help in carrying out compulsions. However, in extreme cases, you might have to step into their OCD world for a while to start negotiating or communicating with the sufferer. When someone in the room yawns or coughs, suddenly it triggers a chain reaction of yawns or coughs. Why is that? We have been blessed with a natural ability to empathize. When we see someone being poked with a needle, our mirror neurons (sometimes called empathy neurons) are excited just by the mere sight. However, when we cannot ‘see’ the injury physically it is difficult to empathize. This is the dilemma of those who suffer from diseases which are not physically visible or which do not appear in any blood test. Being a migraine patient myself, I know that my list of vocabulary feels very incompetent to describe the pain I am having. You might never fully understand the world of an OCD sufferer. You can talk about OCD all day long but you cannot know the agony and pain until you’ve experienced it. But, if you have someone close who suffers from this problem, the best you can do to them is to read about the problem and empathize with them rather than being judgemental. Rather than labelling them as crazy, help them cognitive restructuring and exposure response prevention therapies. American Psychiatric Association (2000), Diagnostic and Statistical Manual of Mental Disorders, 4th edition, American Psychiatric Association, Washington DC. Ciarrocchi, J. (1998), Religion, scrupulosity, and obsessive-compulsive disorder, Obsessive Compulsive Disorders: Practical Management, 3rd edition. Davis, L. (2008), Obsession - A History, The University of Chicago Press, London. Greenberg, D. (1984), Are religious compulsions religious or compulsive? A phenomenological study, American Journal of Psychotherapy, 38 (4) pp. 524-532. Hyman, B. and Pedrick, C. (2010), The OCD Workbook, Third Edition: Your Guide to breaking free from Obsessive Compulsive Disorder, New Harbinger Publications, Oakland. Jenike, M. (1998), Theories of etiology, Obsessive Compulsive Disorders: Practical Management, 3rd edition. Lafluer, D.L. et al. (2005), N-acetylcysteina augmentation in serotonin reuptake inhibitor refractory obsessive-compulsive disorder, Psychopharmacology, 184(2):254-256. Rasmussen, S. and Eisen, J. (1998) The epidemiology and clinical features of obsessive compulsive disorder, Obsessive Compulsive Disorders: Practical Management (eds M. Jenike, L. Baer & W. Miniciello), pp. 12 -43. St Louis, MO: Mosby. Murphy, T., Zine, E. and Jenike, M. (2009) Life in Rewind, Harper Collins Publishers, London.